One-Part, 13pt. Light Green. 4-3/4" X 2-3/8" (Size #5). 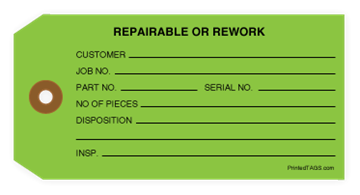 This durable repair tag can be marked with any writing utensil, ideal for quick tagging on the job site. The bright color brings attention to machinery and equipment needing reworked re-tooled or repaired. Quickly mark it up and tag it on.